"I recently saw your caricature of Obama at http://www.caricature.com.sg/2008/11/caricature-of-barack-obama.html and was impressed. Now I'm looking for someone to make a specific caricature of him with a theme. A rollercoaster theme to be more specific. Now I'm writing to ask if making caricatures of celebrities is even possible, and of course what you would charge for it. It would be for private use only and it should be coloured. 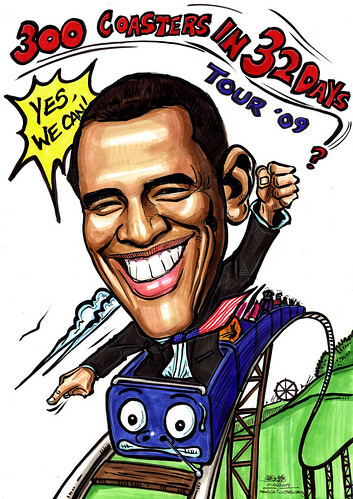 The main drawing should consist of US President Barack Obama riding a brown wooden roller coaster. I don't think you'll need a reference picture of President Obama, but if you do, you can of course contact me. If you need a reference picture of a wooden roller coaster, I can direct you to following site: "http://www.rcdb.com/ig752.htm?picture=1". If you need any other reference, this site has many other pictures. President Obama should have one or two arms up in the air, also shouting his famous phrase "Yes, we can!". 300 coasters in 32 days? The "Yes, we can!" phrase is what the President is shouting. The background should consist of a typical amusement park skyline. Somewhere in the drawing there should be a United States flag or the typical "stars and stripes". Where this will be, I leave up to you. It can be in the background, on the roller coaster, on his jacket, in his hand, or whatever good idea you have. Any other design elements (clothing of the President, color of the roller coaster car, details in the background, etc.) I leave up to you. I have seen your other work and I'm confident that you can make some fitting choices! If you have any further questions, please feel free to contact me any time! Initially, I thought the client is using this caricature for some magazine or newspaper, as she asked for Obama on roller coaster. Obama has been giving the markets surprises since he came into office. His (first day as US president) inauguration send the market down. His stimulus package plan also send the market up and down. Roller coaster ride is the best depiction of this scenario. Me and a friend are theme park / rollercoaster enthusiasts from Germany. This year we plan to make a trip to the US to visit several parks in 32 days and ride the rollercoasters there. Because the trip is quite big we wanted to have a "logo" or something similar for it. That's when the idea for this caricature was born. It will be I nice memorabilia in the future! I have to say that I am very impressed! This turned out much better than I anticipated! I love what you did with the rollercoaster train! I will definately keep you in mind for future work and recommend you to others! Also, thanks for the high quality .tiff copies! A big "Thank You" for your work and very nice cooperation! I just came across your site today and its refreshing to view, just the job after the busy day I had. Feel free to update your works to the site as well, you're very welcome to do so.